Old Crossleyans were unable to prevent Yorkshire One leaders Moortown from securing an important 28-17 victory in their push for promotion in an entertaining game at Broomfield Avenue. The visitors caught the Crocs cold in the opening half hour, scoring three unconverted tries and depriving the hosts of any meaningful possession and territorial advantage. When Moortown extended their lead to 25-5, 10 minutes into the second half, the home support possibly feared an even wider margin of defeat. Instead, Crocs produced a stirring fightback, scoring two quality tries and asking serious questions of the Moortown defence. Arguably, their performance in the final half hour merited reward in the form of bonus points but a penalty to the visitors, as the contest entered stoppage time, put paid to any such hopes. Moortown played the first half with a strong wind behind them and dominated the opening exchanges. It was no surprise when they opened the scoring after seven minutes following an accurately drilled kick down the right wing. They secured the resultant lineout ball deep in the Crocs’ half and the effective driving maul ended with David O’Leary being credited with the try. Crocs kicked straight into touch from the restart and then conceded a further penalty at the breakdown having turned the ball over in midfield. The lead was extended on the quarter hour after an impressive run from Ed Crossley. The ball was moved out wide and Tom Moorby finished in the corner. The visitors looked dangerous every time they had ball in hand. Crocs were being starved of possession and having a man yellow carded only exacerbated their difficulties. Moortown’s third try came after 25 minutes when Eddie Crossland forced his way following several phases of play from their own scrum feed deep in the Crocs’ half. The response from Crocs was immediate and illustrated what they were capable of when gaining sustained possession in the Moortown half. Joe Gallagher’s astute diagonal kick over the defensive line was caught by Josh Hunt and the wingman still had some work to do to finish the move, forcing his way over the try line in the corner. Approaching half time, Joe Stott intercepted a Moortown back line move and raced away deep into the opposition half. 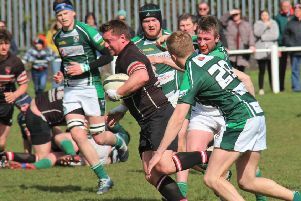 The visitors were subsequently penalised and Crocs chose to take the tap option but a kick over the defensive line was diffused when a Moortown player called for the mark. The opening minutes of the second half were noticeable for a series of turnovers created by excellent Crocs’ defence. Moortown had a player yellow carded but they were still executing their lineout drills effectively. They scored their final try on 50 minutes after Crocs were forced into carrying the ball over the line. The resultant attack from the five metre scrum was repulsed but the clearance kick didn’t find touch. The ball was moved across to the left wing and Luckas Sableman broke through tackles to extend the lead to 25-5. Cue the Crocs’ fightback to remind the visitors that the win wasn’t yet secured. Callum Dunne, playing in the centre rather than his familiar full back role, kicked deftly behind the defensive line, enabling Josh Hunt to gather in the ball and sprint to the corner. Dunne’s excellent touch line kick narrowed the deficit to 25-12. With confidence and self-belief renewed, the next try came shortly after. Martin Hamer won line out ball at the front and jinked his way towards the try line. The ball was recycled and a flowing move along the back line saw Josh Hunt complete his hat trick. The conversion drifted wide but the deficit was eight points with 15 minutes left. Crocs were controlling play and dominating possession. They went in search of a fourth try but the visitors weathered the storm when Crocs were penalised for not releasing in the tackle. Moortown kicked to the Crocs’ ‘22’ and were awarded a further penalty soon after in front of the posts. Crossland’s kick was successful and there wasn’t sufficient time left for Crocs to salvage potential bonus points.